As a wellness professional, you have probably explored the idea of hosting a wellness workshop. You might have brainstormed the topics you’d like to teach and the audience you’d like to reach, and maybe you’ve even put together your agenda and found a location. Now comes the question of how to reach people and get them to your event without spending a fortune on advertising. While there is a myriad of online channels you can explore to boost your event attendance, you don’t want to overlook some good old “grassroots” methods to get your event filled. 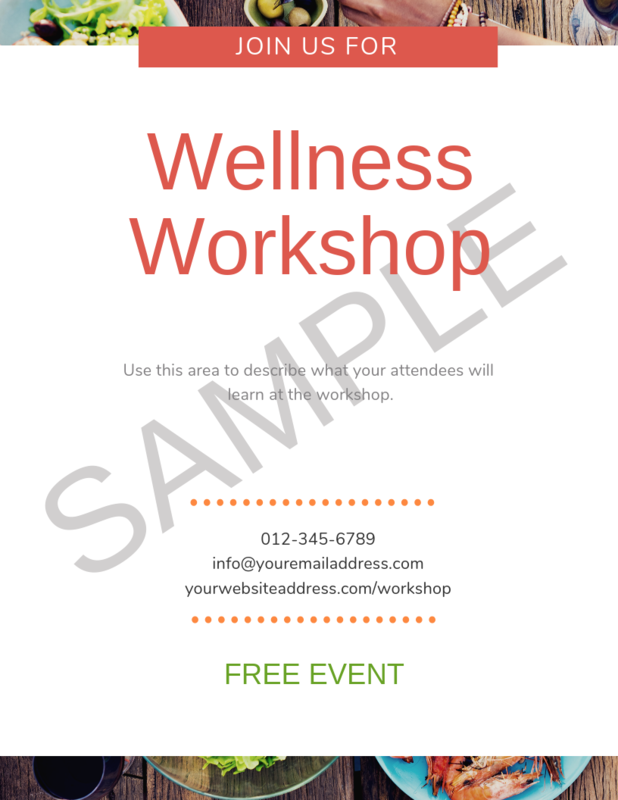 You might instantly think of Facebook Ads or other online-focused methods to market your event, but have you thought of using flyers to promote wellness workshops that you offer? Event flyers are definitely an “old school” method for attracting attendees to your event. But here’s the thing. They also have the potential to drastically boost attendance at your local event – if done right. Although it seems like everything has gone digital these days, using flyers for your workshop is still a great way to get more people to attend your workshops. You see, even though it seems like everything is done online these days, traditional ways of marketing – like using flyers to promote wellness workshops – are not dead. Workshop flyers can help deliver information to your target audience, and give them nuggets of information that pique their curiosity and get them interested in your event. And you don’t have to be a graphic designer in order to produce an eye-catching flyer. Nowadays, there are accessible online tools that you can use to great attractive flyers and many of them are free! In this post, you’ll learn a simple roadmap for using flyers to promote wellness workshops, from easy ways to create them to how to distribute flyers in your local and online networks. 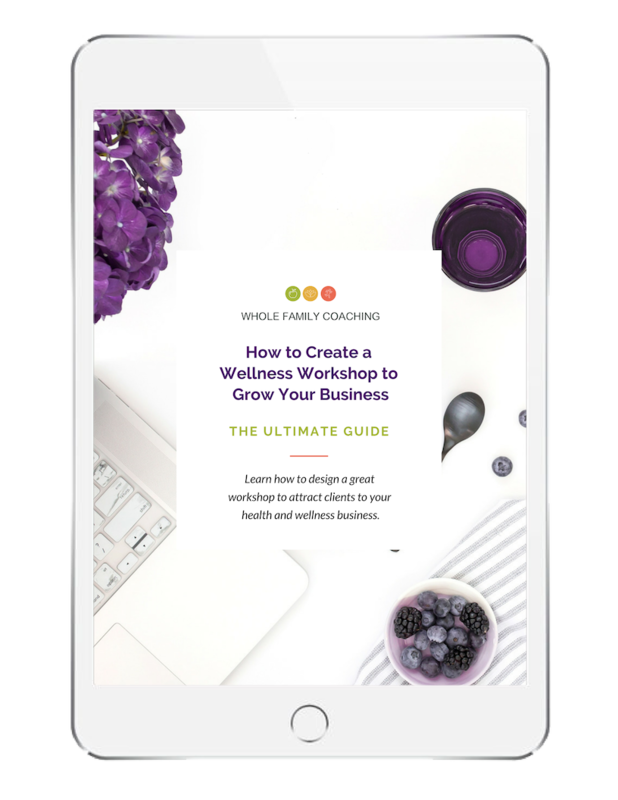 Regardless of your experience, this is an easy to follow guide that will give you tips and tricks on how to create great flyers for your wellness workshops and get them into the hands of more people. Let’s take a look at some of the components you’ll want to include in your flyer to make the biggest impact. Catchy Title – The title is what will attract the eye of the reader. It can be a question or a statement. Make it engaging, attention-grabbing and relatable. Image – Whether it’s your headshot or another image that captures the message you’ll be sharing, including an image on your flyer will make it more attractive. Description – Besides the title, you’ll want your flyer to have a brief and succinct description of what to expect and what will be gained by attending your workshop. Give a few teasers that make them curious to learn more. Date, Time and Location – Be clear about when and where the event is being hosted. Offer additional directions if warranted. Registration Information – How can those interested sign up for the event? Is there a fee or is the workshop free? Make this clear on the flyer. Also, you’ll want to include the name, email, website and/or phone number of the host. Now that you know what needs to be included in your workshop flyers, let’s dive into how you’ll create the actual flyers. This is where a lot of people get stuck, because if you do not have a natural gift for design, you might give up at this point. But it’s doable if you follow the tips below. You have a few options here when it comes to creating flyers, and they typically fall into one of two categories: DIY or outsourcing. We’ll take a look at both of these options next. Going the DIY route is your first option. If you choose to design your own workshop flyers – and you have no design experience – you’ll want to select an easy-to-use tool to do this. Fortunately, there are several to choose from. Here are a few. Canva – This is a great online graphic design tool for beginners. Canva offers a variety of features from custom graphs to photo editing. It even gives you the option to have prints delivered right to your home! You’ll have the option to choose from hundreds of different photos, icons, and templates. The step by step tutorial is so easy, you’ll be customizing your own images just like the pros! Google Docs – Google Docs is another great (and free!) option for setting up your flyers. It may not have a tutorial, but it does offer smart editing and styling tools that you can use to customize templates and images from their library. You can also collaborate with other members of your team to create amazing flyers for your workshop. Google Docs automatically saves after every edit and is accessible from your laptop and phone! Crello – Crello is an expert graphic design tool that offers a plethora of design resources at your fingertips. Their free version is pretty limited, but the paid version not only gives you access to 60,000,000 photos and 11,000 templates (yes, you read that right) but it also specializes in animated designs and photos. Microsoft PowerPoint– If you’re already familiar with Microsoft PowerPoint, try using it to create flyers. You can easily change the size of slides to fit your desired flyer size. With PowerPoint, you can bring in graphics, adjust headlines, and add text to your “slide” to turn it into a snazzy flyer for your event. PicMonkey – PicMonkey is fairly easy to use. This is a comprehensive online graphic design tool that lets you edit photos with designs, icons, and fonts. You’ll have access to tutorials, a resource center, and the print shop. Hiring out your flyer creation could save you hours of days of trying to do it yourself. 1. Display your flyers at local businesses. Scour your local community for businesses that might be a good distribution site for your flyers. Ask the owner or manager if they’d be willing to post or display your flyer where employees and customers can see them. You might look for businesses that have a designated “events” area such as restaurants, markets, gyms, or studios. Also, consider other businesses such as doctor’s offices or spas that may have a waiting room where the flyer can be displayed on the coffee table or magazine rack. This strategy is cost-effective but will require a lot of legwork, literally. If you have a limited budget but you know your target area very well, consider distributing your flyers by going door-to-door and delivering them yourself. It’s definitely going to require much more time, but it might be a good option if funds are tight and you feel certain you will get a good turnout from your targeted locations. 3. Pass out your workshop flyers. This is a great option, especially if you’re outgoing and really ready to make a more personal connection. And the bonus is that this is a budget-friendly option as well. Whether you’re doing this solo, or enlisting the help of friends and family, you’re likely to make a lasting impression by personally passing out your flyer to people you meet in person. You’ll want to target areas that have a high volume of traffic. Be sure that you have permission to distribute flyers if you plan to do so on private properties, however. 4. Mail flyers within your local area. If you have an address list, this may be a great option. Mail your event flyers or invitations to your address list. If you have a smaller number of flyers to be mailed, you can simply print labels and stuff the envelopes manually. However, if you have a large number of workshop flyers to mail out, you can use a mailing service to do this for you. 5. Post your workshop flyers online. Although you’re having a local event, don’t forget that posting your flyers online is a very effective way to promote your workshop. Post a digital version of your flyer on your social media channels, where your ideal attendees are most likely to find it. Be sure to post a copy on your own blog as well as your fan pages for more visibility. If you have a close network of referral partners, they may be willing to host a copy of your flyer on their site also. Just ask them! 6. Email your workshop flyer. Email is possibly one of the most effective ways to connect with people interested in your services and products. 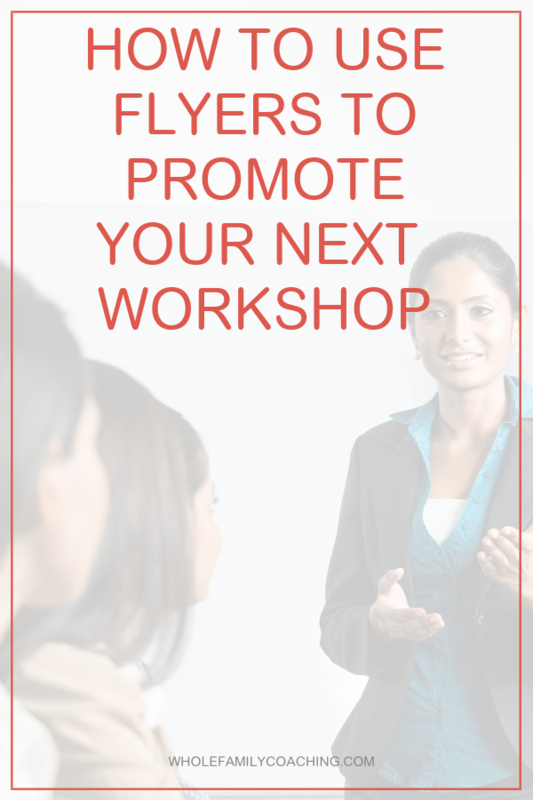 So, send an email to your list telling them about your upcoming workshop. Don’t forget to segment your list and email the workshop flyer to anyone in your geographic area who may be within a reasonable distance from your event. Even if they are not in your area, you may want to send the flyer anyway and ask them to share it with anyone they know who is in your local vicinity.